The winners if NBA owners approve the the Sacramento Kings move to Seattle on Wednesday would be Seattle fans (pictured), NBA players who would save about $4.6 million in taxes and Sacramento taxpayers who would not have to pay the $258 million in tax-money being offerred to keep the team in Sacramento. Steve Ballmer and Microsoft have managed to continue to work in the state of Washington with a 0 percent income tax rate and now he is part of a team offering to let Sacramento Kings players benefit by moving to Seattle. 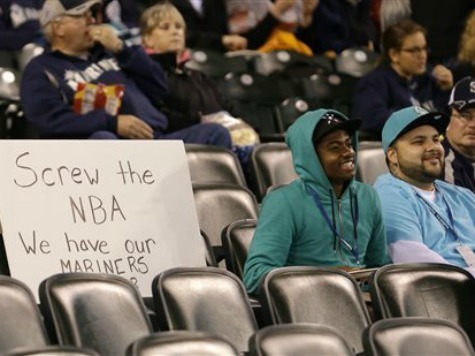 The NBA owners convene Monday to begin to discuss a Wednesday vote on whether to allow Seattle fans like those pictured to have a team, a move that also would save Sacramento taxpayers $258 million to fund a new stadium and the team’s players about $4.6 million a year in taxes as they would keep paying 10.6 percent in state taxes to California instead of 0 percent to Washington (see table below). Instead, it appeared a done deal a couple of weeks ago that NBA owners would instead vote to keep the team in Sacramento even though it would force Sacramento Kings players to pay 10.6 percent for half of their seasons, Sacramento taxpayers would have to foot a $250 million bill for a new arena, and every NBA player would continue to get hit with a proration of the 10.6 percent rate for their road stops in Sacramento. The incentive Vivek Ranadive and his Sacramento group used to win over the NBA owners on the relocation committee was to also forgo their profit share – basically given millions to the very NBA owners who were going to vote on the issue. That coupled with former NBA star and current Sacramento Mayor Kevin Johnston’s move to volunteer $250 million from taxpayers convinced the owners on the NBA relocation committee to recommend the sale and move to Seattle be rejected. The Associated Press reported that Johnston wrote on Twitter after the vote, “That’s what I’m talking about SACRAMENTO!!!!! WE DID IT!!!! !” and the pictured fans in Seattle seemed to assume that was the end of the argument. Not so fast. ESPN reported Friday that Ballmer and his partner Chris Hansen not only sweetened the sales price, but also effectively blocked the NBA owners from receiving the extra millions offered by Ranadive AND offered each of them about $4 million by offering to pay a high relocation fee. They blocked the initial enticement by offering $125 million to Maloof for a minority share if the league did not approve the move, thus allowing Maloof to retain ownership and not let the owners get the portion offered by Ranadive. The table below shows the state taxes paid by players of each NBA team. These figures are prorated, so a player will generally average this tax rate for the more than half the season they spend in their home city (for games as well as practices on off days) while paying smaller amounts for individual games played in other cities. Therefore, every NBA player would pay lower taxes if the team moved to Seattle, because even a player for another team who had two road games against Sacramento-Seattle would have to calculated either a prorated 10.6 percent for two games in Sacramento or a 0 percent in Seattle. New York Yankees players pay far lower taxes by getting to build up a bunch of work days in the Florida Grapefruit League during Spring Training (0% state income tax) before having to play 81 games in New York (9 percent) and others spread throughout other states. Likewise baseball players for California’s teams get to skip over to the Cactus League to offset their 10.6 percent tax rate with a lot of work days under the 4.5 percent tax rate in Arizona.